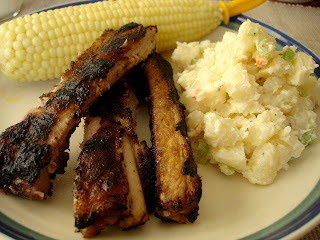 We've never made ribs so we decided to try them today. 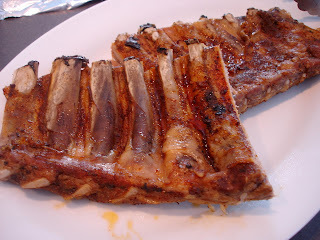 We tweaked an Alton Brown Recipe called Who Loves Ya Baby Back that we found on the Food Network web site. They were very tasty and tender. 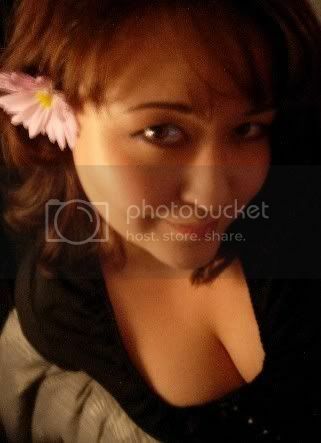 It's a lot of work to make them, but I'd do it again. Mix the above ingredients in a microwave safe bowl. Warm for 1 minute immediately before cooking ribs. 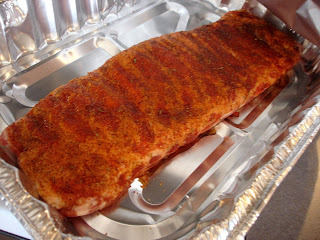 Put the ribs in a large baking dish; I used a throw away foil one to avoid a messy pan. Pour the braising liquid into the dish and cover tightly with foil. Cook for 2.5-3 hours on 250 degrees. We then put them on the grill for a few minutes on each side. They crisp up very quickly - we probably could have done them for just a minute or two on each side. In the original recipe, Alton Brown puts them under the broiler instead of on the grill, but it was way too nice outside today to not use the grill!! Since they take so long in the oven, we enjoyed a few glasses of wine (our favorite hobby!). 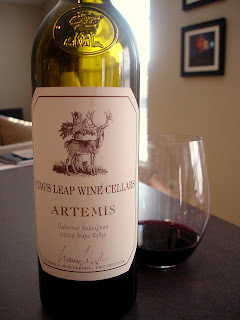 Jon splurged at the wine store so tonight it was Stag's Leap Artemis Cabernet Sauvignon. So amazing!!! It is one of the best bottles we have had in a while - full bodied, deep, and "pretty yummy." Wish this was only 12.99 so it could be an every day wine! It was in the $40s. This is a recipe that started with my grandmother. My mom now makes it and I've perfected it as well. It's very simple, nothing fancy, but is SO good. Jon loves it and will ONLY eat MY potato salad! Cook the potatoes in a pot of water (just covering the potatoes). Remove them as soon as they are fork tender. Let them cool on a cutting board, and then cut into bit sized pieces. Mix with the veggies and mayonnaise, but add the mayo slowly - you only want the potatoes coated, not dripping in mayo. Add salt and pepper to taste. Chill for several hours before serving. You may need to adjust the mayo and spices before serving.